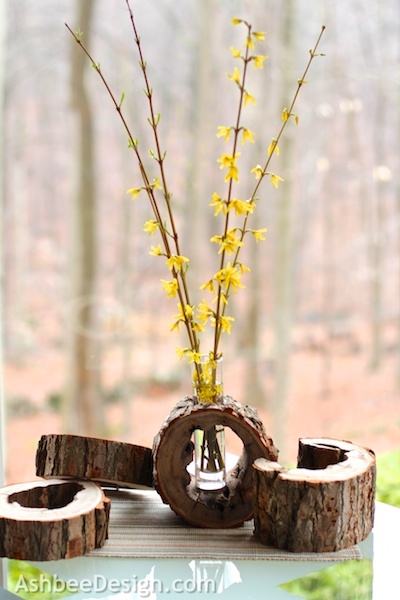 Spring never comes soon enough and to help it along I bring in Forsythia branches and force their blooms. 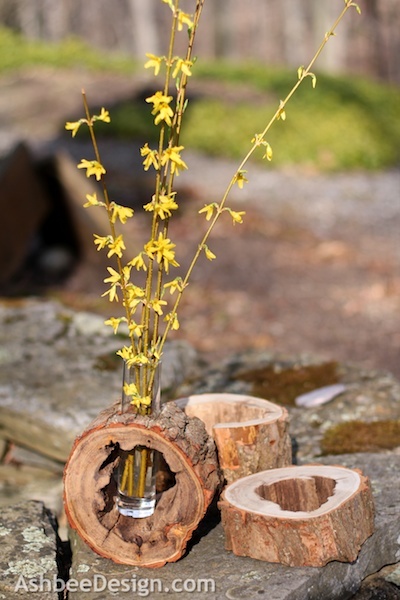 I have posted about this before and decided this year to create a new vase for the branches as they flower. Keeping it fresh! Last fall David was working on cleaning up all the dead fall from one of the various storms and I had him cut a collection of slices from a small, hollow tree. I had 6 slices ranging in 3 to 6 inches thick drying over the winter. 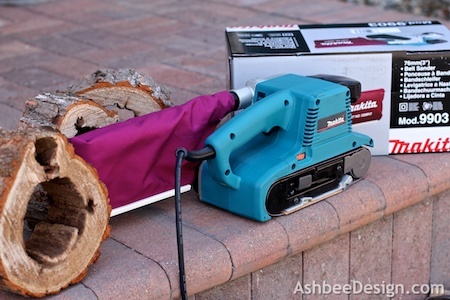 He also gave me a belt sander for Christmas because these log slices aren't the only chunks of trees I have seasoning! I decided on one of the warm days earlier this week to use those log slices for a centerpiece. 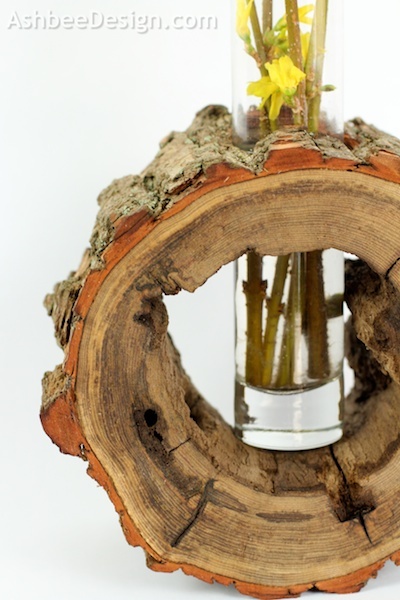 The idea was to create a holder for a bud vase. 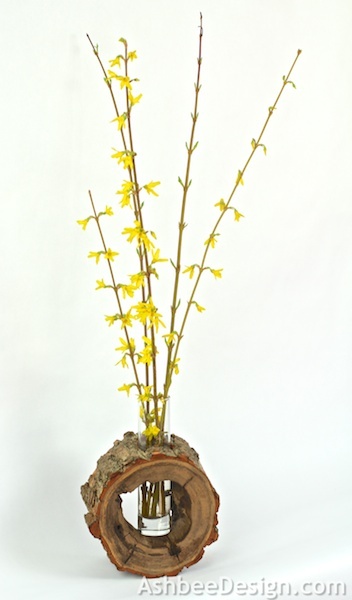 I like the combination of the tall, willowy forsythia branches and the heavy log base. Here are a few process shots and a mini-tutorial. First, a shot of my new sander, straight out of the box. It will never be this clean again. I waited for a warm day to use this because I knew it would create a lot of dust. In fact, it was a windy day so all the dust scattered over the yard. 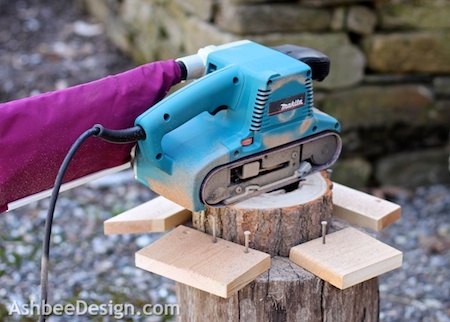 I nailed scraps of pine boards into a chopping block on four sides of the log slice squeezing it in place. I made sure the nails were below the height of the slice and started sanding with 40 grit sandpaper. 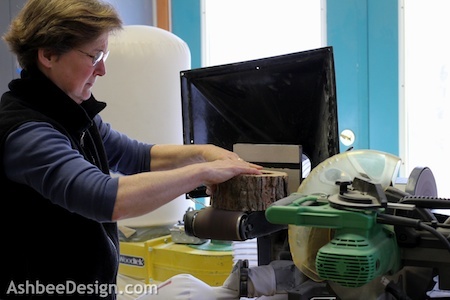 I followed up with 80 grit paper and then moved up to David's wood shop to finish off on his belt sander with 120 grit. 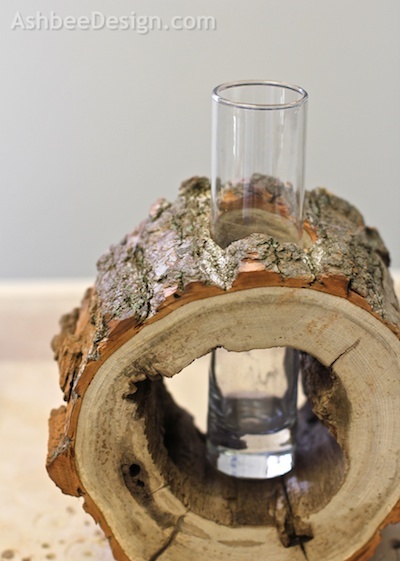 The next challenge was drilling a hole into the side for the bud vase to slide in. We don't have a large enough drill bit and I didn't want to purchase one for a single project. 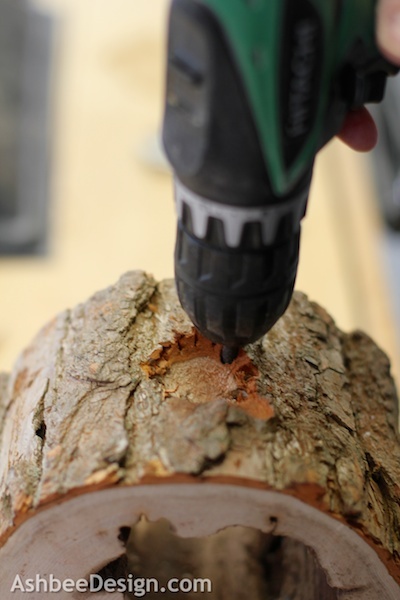 I used a hand drill and drilled many small holes in a circle. I then used a wood chisel to finish the job and pop the wood center out. 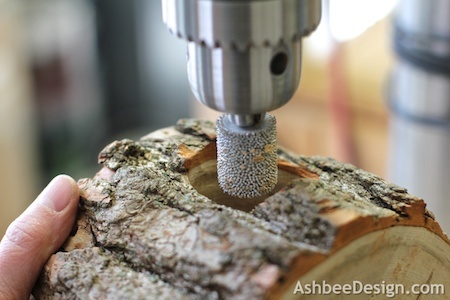 I made the hole smaller than the diameter of the bud vase but then used this grinding attachment to smooth it out and perfect the size of the hole. After some fussing, the vase fit right in. 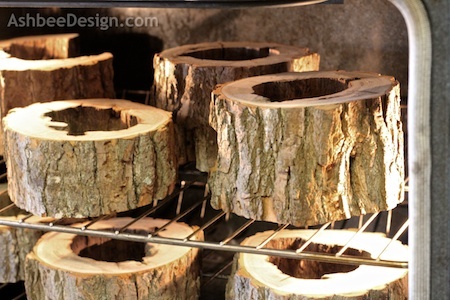 I removed the vase and put all the sanded log slices in the oven. I baked them for 2 hours at 200º in an effort to kill any critters that might still be in residence. Don't know for sure if this works but it is mentioned around the web. 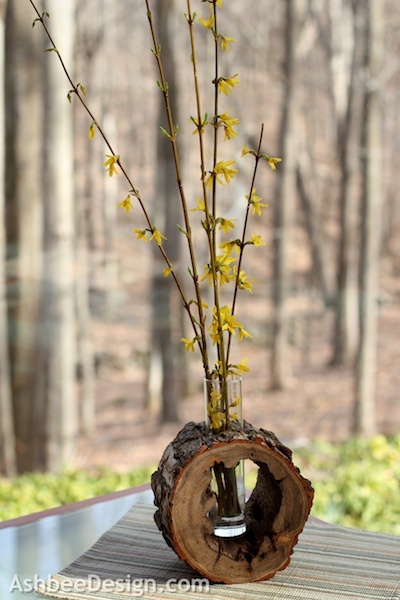 After baking, I put the vase back in, added some water and the budding forsythia branches and placed them on the table in our sunroom. The woods are still brown with few signs of spring buds but I have flowers inside! Beautiful design, so pure - and so creative! I just love using natural elements to create such beautiful decor. Featuring in my weekly wow's on Saturday. I think natural elements is becoming my signature style thing. It is so often my go to starting point. And, it makes a homey statement. Thanks for visiting and commenting. This is so so so crazy cool! I LOVE the look and I love that it was fairly simple to do! Thank you so much for sharing! I just always love your style! Thanks Jamie Lyn. Yes, this was an "easy to do" project. And I can see other easy to do variations. Maybe a candle application next. Thanks for visiting and commenting. Good stumps are rare. Grab then when you can! I need more. You are one clever gal and handy also. 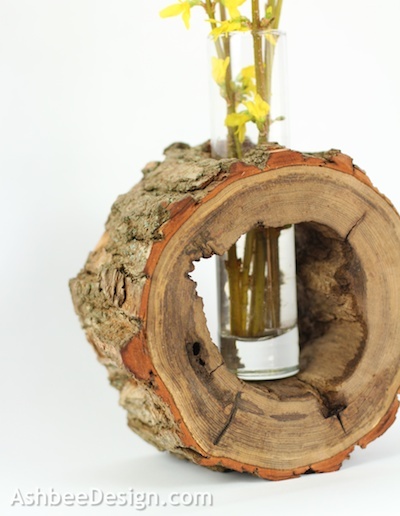 The vase holders are so clever and unique, how smart of you to see pieces of log for what they could be. Your ladder is incredible, looks so pretty no matter what season it is. Love them. My neighbor cut back some of his trees and I went over asking for branches, he looked at me like I was nutso. Ah well, not the first time. We have to learn how to do many things in life and it sure doesn't hurt when hubs isn't around to help. Feels good to be more versatile. We lived in MT on 20 acres just off Canyon Ferry Lake and hubs was gone for 2 or 3 weeks at a time so I was on my own, that means shoveling snow in front of pole shed to get Bronco out and all way out to road in 25 below to 45 below temps. For a city slicker I learned how to do many things I never thought I would need to. We moved to MT from San Diego, loved it tho. Wish we were back there on our 20 acres. Branches are worth grabbing when you can. Generally, around here, they are so high up. You don't have access until you have a major storm and trees come down. You have to get them when you can - even if the neighbors think you are weird. But weird is a good thing. Yes, we can do lots when we decide to, but I most enjoy the projects my husband I work on together. Thanks for visiting again! That is an awesome unique vase! Hi! You were the link before me at The Weekend Creative link party! Just stopping by to say hi! This is so pretty! You do not seem hesitant at all behind those power tools... way to go gal! Thanks for the inspiration! So creative and beautiful!!! Thanks for linking up at Romance on a dime!! Pinning this. What beautiful and creative vase! So unusual! I am looking for some fun crafts to feature on my web site soon...would love for you to submit your project! Very creative! I really like this idea. Thanks for sharing. Well, for whatever reason I can't get the reply button to work beneath the messages on this post. Thank you all for your positive comments. It is amazing how they do make a difference and spur me on. I don't have advertising on my site so numbers don't mean a lot. The comments do. thanks to every one of you for taking the time and visiting.